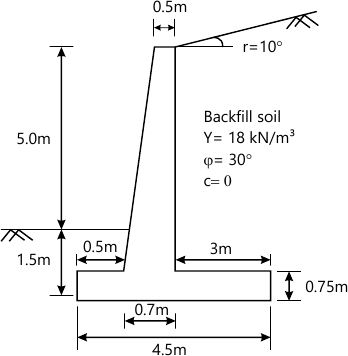 4 (a) For the cantilever sheet pile wall shown in Figure 1, compute the embedment depth below the dredge line. (a) Find the depth at which the foundation should be loaded to provide a factor of safety of 3. 6 (d) Following data was obtained in a vertical pile load test on a 300 m diameter pile. Plot the load-settlement curve and determine the allowable load as per IS code.